This book looks at Slovak American history, folk arts, and the favorite Slovak recipes of the author’s family. 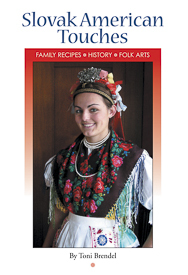 Also included are sections on famous Slovaks, kroj folk attire, folk artists, museums, libraries, decorative eggs, Slovak American events, pottery, heritage, Czech and Slovak queens, folk dancers, musicians, bobbin lace, fraternals, Pennsylvania Cathedral of Learning, Slovak wedding traditions, and holiday traditions. A 24-page section of color pictures showed a goodly number of Slovak folk dancers in authentic kroj costume. Vdolky is a sweet roll that looks like a flat Bismarck but doesn’t have jelly inside. It is served with prune filling, cottage cheese, and a dollop of sour cream. Very Slovak. Dissolve yeast in warm water, add milk and sugar. After yeast works, add beaten eggs. Mix remaining ingredients as for pie crust. Add yeast mixture. Work together, kneading well. Set aside and allow to rise. When dough is doubled in bulk, roll out to half-inch thickness. Cut out circle shapes (you may use a 2-inch biscuit cutter). Place on lightly greased cookie sheets. Set aside and allow to rise again to almost double in bulk. Heat large electric frying pan to 250-300 degrees. Very lightly grease the bottom of pan, wiping excess off with paper towel. Lay pieces of dough in fry pan, not too close together. They will continue to rise in pan while cooking. Turn over as each piece browns. Do not cover. Brown both sides and edges. This takes time and cannot be rushed. These also may be baked in the oven. Mix and serve over Vdolky.